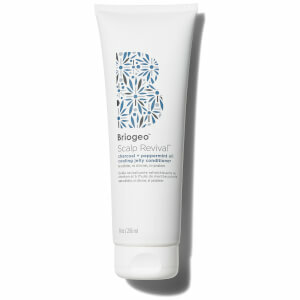 Strengthen and restore your hair with the Briogeo Dont Despair, Repair! Deep Conditioning Hair Cap System, a two-part hair repair system that combines the reparative properties of the Don’t Despair, Repair! Deep Conditioning Mask with an essence-infused hair cap. The nourishing hair mask contains a cocktail of strengthening and restorative ingredients (including Panthenol, Algae extract, B-Vitamins and Rosehip Oil) to intensely hydrate and repair dry, damaged hair, whilst the innovative hair cap locks in moisture and steam to open the cuticle and enhance the efficacy and delivery of the hair mask's ingredients. The cap's inner fabric is lined in naturally reparative micro-oil beads which helps to mend damage and enhance hair's resilience. After use, straight, wavy or curly hair is left feeling fortified and replenished with improved health, shine and strength. 98% naturally derived. Cruelty free. Safe for colour, keratin, chemically-treated and relaxed hair. Free from gluten, sulphates, silicones, phthalates, parabens, DEA and artificial dyes. Step 1: Apply the Don't Despair, Repair!™ Deep Conditioning Mask to freshly washed, wet hair. This concentrated repair treatment is formulated with hair strengthening and restorative ingredients, including algae extract, panthenol, b-vitamins, and biotin, to transform weak, damaged hair to a strong, healthy, and shiny state. Step 2: Cover the hair with the Don't Despair, Repair!™ Ultra Repair Essence-Infused Hair Cap and leave on for 15 - 60 minutes. This unique hair cap contains an inner lining that is infused with an ultra-nourishing repair essence that enhances the performance of the Don't Despair, Repair!™ Deep Conditioning Mask to provide intensive repair and strengthening benefits. The outer plastic cap locks in moisture and steam to open the hair cuticle for optimal absorption of the treatment's nutrients. Step 3: Remove cap and rinse hair with warm water. Dry and style hair, per usual.